Archdiocese of Washington - What is the Orthodox Church? 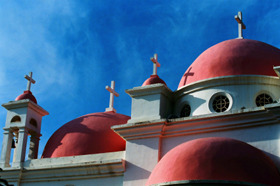 The Orthodox Church is the original Christian Church founded by Jesus and continued by his Apostles. It is the same Church described in the Bible as the Body of Christ and the Bride of Christ (1 Corinthians 12 : 27; Ephesians 5 : 23–25). Throughout its 2000-year history Orthodox Christianity has remained faithful to the teachings and practices passed on from the Apostles and early Church Fathers (2 Thessalonians 2 : 15). Unlike the Catholic Church since Vatican II, the Orthodox Church has had no liturgical reform. It maintains a richly beautiful liturgical tradition with many customs dating back to Apostolic times, including fasting on Wednesdays and Fridays, receiving Communion on an empty stomach, ancient liturgical prayers and chants, frequent sacramental confession, standing or kneeling during services instead of sitting, and baptism by full immersion. In the Orthodox Church there is no universal liturgical language (such as Latin in the Catholic Church); it has always been our tradition to pray in the local language. Orthodoxy also upholds the ancient practice of married clergymen, while also valuing and encouraging celibacy for those who are called to it (cf. Matthew 19 : 10–12). Protestant denominations (such as Baptist, Anglican or Episcopalian, Lutheran, Presbyterian, etc.) have their origins in 16th-century Western Europe. These groups were a departure from the Catholic Church which, five hundred years previous, had departed from the Orthodox Church. Some of the Protestant reformers were earnestly trying to return to the Church of the New Testament – the early Church of the Apostles, which they believed had been distorted by the Catholic Church. Ironically, with a bit of education they would have found what they were seeking in the Orthodox Church. In recent years, many groups within Protestantism have abandoned fundamental Christian doctrines and moral teachings, despite the clear witness of Holy Scripture, so highly valued by the 16th-century reformers. But the theological and moral vision of Orthodoxy – what Saint Paul calls ‘the mind of Christ’ – remains unchanged (1 Corinthians 2 : 16; cf. Hebrews 13 : 8). The word Orthodox is Greek for ‘right glory’ and refers to the correctness and truth of the Orthodox Church’s faith and worship (cf. John 4 : 23–24). The Divine Liturgy (what Catholics often call the Mass) is the very heart of Orthodox life and faith. In it we receive Holy Communion which unites us with other Orthodox believers throughout the world. We are also united to the whole ‘communion of saints’ – all the departed martyrs, holy fathers and mothers of past ages – who join us and the hosts of angels in giving unceasing glory to God (cf. Isaiah 6 : 3; Revelation 7 : 9–17). But most importantly, Holy Communion unites each of us to Jesus Christ, for he offers himself to us in his very Body and Blood (cf. John 6 : 53–57). 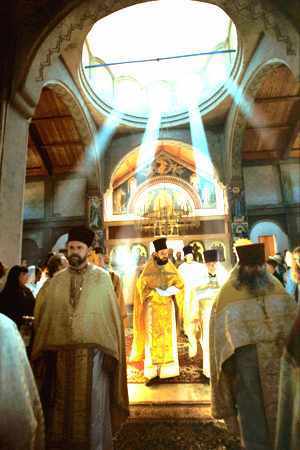 Orthodox parishes celebrate the Divine Liturgy every Sunday morning as well as on many feast days throughout the year. The Orthodox Church maintains basic Christian moral positions on the sanctity of life and marriage. Marriage is between one man and one woman for life, and this is the only appropriate context for physical relations that can lead to childbirth. Abortion, euthanasia, divorce, and homosexual activity are a few examples of actions which seriously distort God’s loving purpose for our lives. However, there is no sin that God will not forgive and whose damaging spiritual affects God cannot heal. Through constant prayer, through participation in the Church’s sacraments and the study of Holy Scripture, through serious struggle against our strong inclinations to sin and selfishness, and through gestures of loving self-sacrifice for others, we strive to enter more deeply into communion with the God who is Love (1 John 4 : 16). Union with God constitutes man’s only true and lasting happiness. It is this union and this happiness which Christ Jesus longs to give us, and the Church exists to make that happen. The above text was compiled and edited by Hierodeacon Philip (Majkrzak), much of it adapted from Father John Breck.